PA Chairman accuses Israel of trying to “destroy” the Al-Aqsa Mosque by allowing Jews to pray on the Temple Mount. Palestinian Authority Chairman Mahmoud Abbas has accused Israel of trying to “destroy” the Al-Aqsa Mosque by allowing Jews to pray on the Temple Mount. In an interview he gave on Thursday to the Saudi-based Al-Watan newspaper, Abbas said that "the Al-Aqsa Mosque is in danger," claiming that Israel prevents PA Arabs from praying at the mosque, while allowing “extremist Jews" to worship there. This, he claimed, is proof that Israel has a "malicious" and dangerous plan to destroy the mosque and rebuild the “false” Holy Temple in its place, as he put it. Arabs continuously make false accusations that Israel is "Judaizing" the Temple Mount, sometimes resorting to ridiculous propaganda such as accusing Israel of using chemicals to erode the foundations of the mosque in order to cause it to collapse. A claim similar to Abbas’s was made several months ago by a PA official who also said that Israel was trying to build a new Holy Temple on the Temple Mount. The official claimed that an analysis of Jerusalem's development plans finds that there is an intention to Judaize the Al-Aqsa Mosque, and within this framework build the Temple on its ruins and to then reduce the number of Arab residents in the city. The reality, however, is that it is the Jews – not the Arabs – who are discriminated against when they want to pray on the Temple Mount. The Waqf, which was left in charge of the Temple Mount following Jerusalem’s reunification in 1967, has removed every sign of ancient Jewish presence at the Jewish holy site. Police, in an attempt to appease the Waqf, limit the number of Jewish worshippers allowed on the Temple Mount at one time in order to prevent conflict with Muslim worshippers. They often close the Mount to Jews in response to Muslim riots – despite evidence that Muslim riots have been planned in advance for the specific purpose of forcing Jews out. 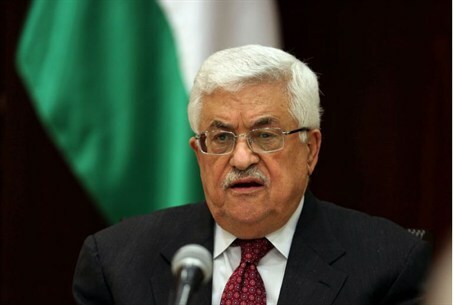 In the interview with the Saudi newspaper, Abbas also made it clear that no negotiations will take place with Israel as long as it continues to build in Judea and Samaria and refuses to accept a two-state solution based on the indefensible pre-1967 lines, that were termed “Auschwitz borders” by the late former Foreign Minister Abba Eban. As for the idea of land swaps between Israel and the PA, Abbas said that these should be limited, but added that in any event the PA will demand all of Judea, Samaria and Gaza. Jerusalem, Abbas said, is not up for negotiations or bargaining, since the Arabs will never give up on it, and there will not be a Palestinian state without eastern Jerusalem as its capital.